Indian Railways is the lifeline of this country, running more than 20,000 passenger trains and over 9200 freight trains daily, both on long-distance and local commutes. I can't imagine there is anyone in this country who has not traveled at least once with the Indian Railways. Today is #ThrowbackThursday. 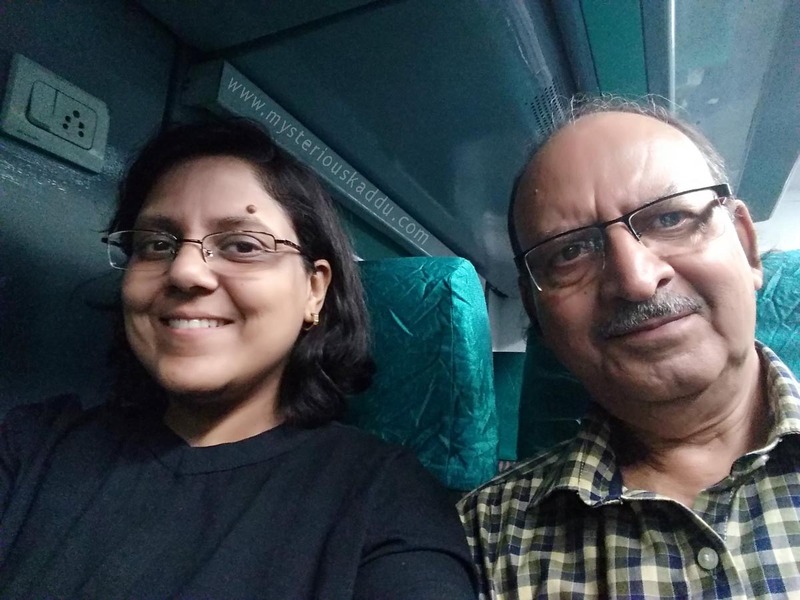 So I'm sharing with you some of my personal memories of journeys with the Indian Railways. I have never had the opportunity to be a regular local-train commuter. So all my experiences are from long-distance train travels only. Here are some of them that I'll probably remember as long as I live. I remember there being thin & soft rumali-rotis, in stead of the leathery, mostly half-cooked parathas! And the "pot-waali chai"! Do you remember that? They gave you the option of heaving the ready-made mixed tea or the "pot tea", with plain boiled water in a thermos, along with tea bags and pouches of sugar & milk-powder. You could make your tea as per your taste. I have often traveled alone in Indian trains. And while I have heard of so many tales of bag-snatching, drugging, and robbery in trains, I have been fortunate to have always come across good people during my train trips in India. The guys have always agreed to swap their lower berths for my upper berth. They've helped me with my luggage, and even haggled with the coolies for me at NDLS! :D Oh and this couple I met during my train journey from Patna to Chennai, in 2006, they became such good friends that I'm still in touch with them! Like I said, I've met some really kind and helpful people in my train travels. Not just me, in fact, but my entire family. I remember when my grandfather died and we had to go to Calcutta (now Kolkata) from Kanpur, at a day's short notice. I was 12 that time. We could only get Waitlisted tickets. Not even an RAC. The TTE took pity and allotted us one berth, even though there were other waitlisted passengers before us. So there we were... mom, dad, my sister and I, four of us packed on one berth. That's when another couple there, who had two reserved berths, gave us one of theirs. Just like that. Said it's just one night after all, and we would at least get to stretch our backs for a while. We were really touched by their kindness. Another time, our train got cancelled and we had to take general tickets on the next day-train out. The entire coach was filled with soldiers (Indian army or CRPF, I don't quite remember). Their luggage was strewn across the floor of the train. There was hardly any space to put your foot. Those uniformed guys told us to walk right over the bags to our cabin. And when it was time to get off, we were worried we won't reach the door in time. But the same guys helped us out, passed along our luggage too! Smiling all the while. The old non-AC one. Have you ever traveled in it? Do you remember when they discontinued it? So many games we used to play on our train trips! Do you remember? Counting the poles/trees was definitely popular when we were little. And board games. Ludo, Snakes & Ladders, Checkers. Even Monopoly was possible in the 1st class coach. And yes, packs of playing cards always accompanied us on all our train trips. And my favorite pocket video game too! Then, of course, we had the paper & pen games, like TicTacToe and "Name Place Animal Thing" (NPAT). Have you ever played NPAT? What other games did you play as a kid during your train travels? Have you had any big escapades during your train travels? The other incident happened when I was still in school, during a Kanpur to Patna journey, when our train got derailed. Not a major incident. Nobody was injured. Some repair-work was going on along the tracks, so the driver had already put us on minimum speed. Despite that, the last 2-3 coaches went off the tracks. So we had to stop and wait for a "rescue train". We waited for hours, but the "rescue train" never came. This was during peak summers (summer vacations in school), and we soon ran out of drinking water. The train was stuck in the middle of some farmland, with nothing but crops for miles. Then the farm owner showed mercy on us and started his bore-well, so we could refill our bottles and water campers. Eventually, some guys on the train discovered that the DGP, Bihar (or some other senior police official, I don't really remember for sure) was also on the same train with us, and that he was getting his separate "rescue team", even as we had been completely forgotten about. So these guys went and stopped that officer from leaving without doing something for us. Finally, someone came up with the plan to relocate the passengers of the derailed coaches into the other coaches, disconnect those coaches from the rest of the train, and proceed to our destination. All journeys in Indian trains are marked by some characteristic smells. You simply can't NOT experience these smells, as long as you have a functioning olfactory system! The smell of food during meal times. Parathas and achaar, mathri, samosas, some very appetizing homemade dishes in people's tiffin-boxes, even the smell of the non-veg curry from Railway's meal packs! The smell of sodden socks. Yucks. You simply can't avoid it if your are traveling overnight in a 3AC or 2AC coach! Especially during the summers and monsoons. As soon as people start settling in for the night, i.e. they take off their shoes, you're hit by this smell. 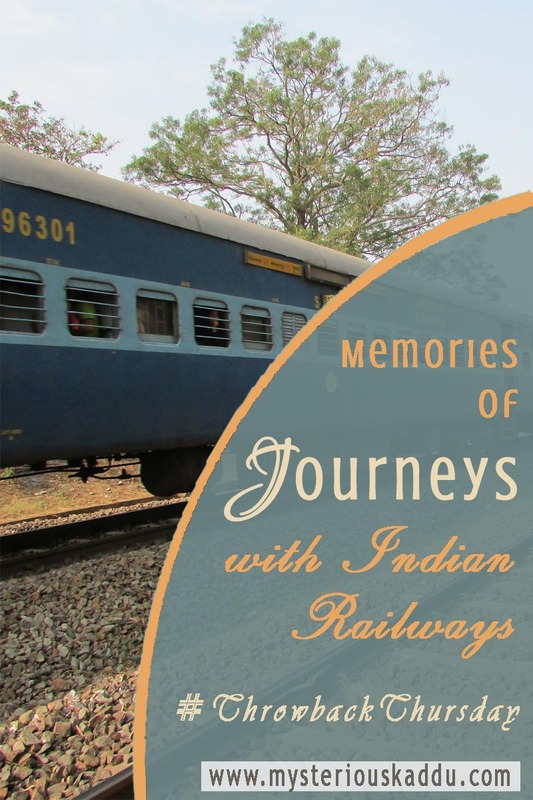 So these are some of my most unforgettable memories of journeys with the Indian Railways. What has your experience been like with them? Do you recall any memorable incidents from your train travels in India? Interesting people you might have met? This is my tenth post for A to Z 2019. It's been a while since I traveled by train but train journeys do hold a special place in my heart. You covered all the aspects and brought a bag full of memories along. I remember making so many friends during my train journeys. Haven't travelled in one for a long time now. But your post makes me want to do so soon. I have read this thrice before writing a comment. This is the most beautiful piece that I've read this week. It brought back so many memories of my childhood. The first train trip from my small town to Kolkata, the first Rajdhani express trip from Kolkata to Delhi. I think I time traveled with you today. Such a lovely post, Kadambari. I have never had food served in the train. NEVER. In Rajdhani and Shatabdi's I just have packaged food like biscuits, curd, cold drink, ice-cream etc. Yes, have met some good people and some annoying ones too. I hate people who talk loudly or play videos or songs on their phones for the entire compartment to hear. And I meet such people the most. Sigh. The waiting time have reduced considerably as most of the trains run on time these days. I had a misadventure last year. I gave the wrong booking details to the travel agent. I boarded the train only to find that my ticket was of the day earlier, meaning that the journey was already over for that ticket. TTE suggested that I get down at the next station and buy the general ticket and he'd convert it into AC. I told him that I will not get down from the train and he can charge me whatever due penalty. Nice incidents and made my nostalgic actually. What a delightful read! I remember train journeys for sure - and the smells and the food. My memories pre-date yours when the trains weren't so crowded and the food was actually yum I can never forget the creamy scrambled eggs on a thick buttered toast that we used to get on the Deccan Queen. The trains were much cleaner then and the toilets didn't smell of urine. But the part I can never forget was the coal engine which left our faces black when we stuck them out of the window. The trains weren't air conditioned in those days and we would put up wet towels on the window to get cool air. What a memory laden post Kaddu - I was grinning the entire time for so many of these things seemed familiar. Love the pinterest graphic - very well made! And this changing of upper berth and lower berth is a concern for most of us..ha ha! Once traveling from Delhi to Gujarat on train with family, we complained to caterer about food and tried writing it in complaints book, he did not allow us to do that! In my childhood days have traveled a lot with my parents on train to different destination and our favorite past-time was antakshari! I have travelled more on mumbai locals than long distance trains. I travelled to college by 6.04 am local and boarded the 11.42 am local back. Such is the precision timing of mumbai.